Up _before_ the crack of dawn in order to get to Uluru for sunrise. The locals had proscribed set areas to view Uluru from so it was pretty crowded at the viewing platform. 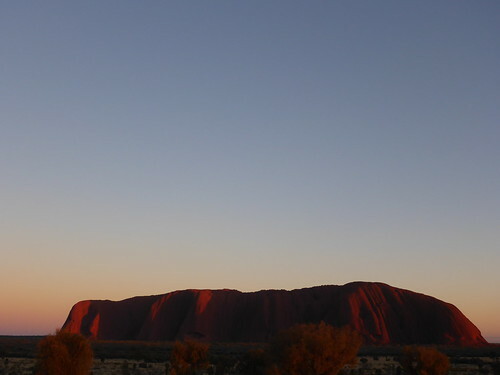 It looked spectacular through with the changing dawn colours shown on both Uluru itself and the dawn sky around it. It did look vaguely unreal; like you’d expect a large Martian tripod to walk across it at any moment. It was pretty awe-inspiring to be honest. After the sun had risen we were taken on a tour around the base of the rock and on a walking tour around one of the two waterholes. The two guides talked us through what native life was like and how it tied into the oral histories of the area. It was fascinating how the stories reflected the appearance of various aspects of the rock and important lessons that were needed to survive in a land where everything was trying to kill you. That said, what I found more amazing was the overview about the geological process that caused Kata Tjuta and Uluru to exist. Thousands of years, unique starting conditions and the interaction of continental forces were all necessary to get such a unique rock structure. 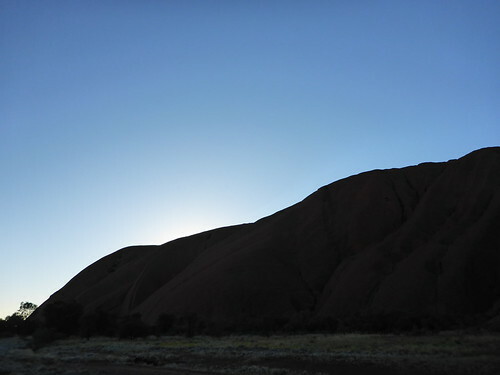 As just one example, more and more of Uluru is being exposed because the variation in temperature between the two ends causes massive winds to blow around the base which is slowly wearing down the ground surrounding the rock. Some slight disasters back the hotel (Zergling No 2 jumped into water so cold she promptly burst into tears) but we had a great set of pizzas and we settled down.